Lose Weight Without Dieting or Working Out is written by nutritionist and life coach, JJ Smith. She is known for her appearances on The Montel Williams Show and The Jamie Foxx Show. This program was designed to help you lose weight permanently by cleansing your body and providing it with slimming nutrient-dense foods. The foundation of this program is the Detox-Eat-Move (DEM) System. This is a three-phase plan that assists you to eliminate body fat, especially from stubborn areas like the hips, thighs and belly. You will cleanse your body avoiding the “Big 6 Foods” for 21-days. This includes caffeine, sugar, starches, meat, dairy, eggs and alcohol. Essentially you will be following a whole foods, vegan diet for three weeks. As a minimum you should take a fiber supplement and a green drink. Other nutritional supplements are optional but highly recommended. It is also a requirement to do colonic irrigation or take colon-cleansing herbs during the detox phase. The detox phase is the most difficult part of the program but also the most rewarding because it tends to produce rapid fat loss. You will reprogram your taste buds to crave natural healthy foods that will begin the process of restoring your health. Indigestion, bloating, and fatigue will be reduced and your skin will take on a more youthful appearance. In this phase you achieve permanent weight loss by eating “clean and balanced foods”. Your diet will consist of 30 percent lean protein, 45 percent good carbs and 25 percent healthy fats. Red meat should be limited to two or three times a week. The foods you will be eating are low in sugar and high in vitamins, minerals, fiber and omega-3 fatty acids. Every time you eat a carbohydrate food you must also consume protein to keep your blood sugar levels stable. You will also start to reintroduce some of the foods you avoided during the detox phase. You are encouraged to keep a journal and determine which foods have negative effects on your weight loss efforts.This will allow you to customize the diet to suit your individual requirements. Fruit, vegetables, salads, oatmeal, whole grain cereal, whole wheat bread, quinoa, brown rice, sweet potato, turkey, chicken, lean steak, pork tenderloin, salmon, tuna, eggs, tofu, tempeh, low-fat milk, soy milk, peanut butter, hemp seeds, almonds, flax crackers, rice cakes, extra-virgin olive oil, agave nectar, stevia, herb tea. Smith declares that strenuous exercise is not a requirement for losing weight. Rather if you want to eliminate excess body fat you should aim to do more physical activity throughout the entire day. She says that getting moving doesn’t require going to the gym. Activities like cleaning the house, grocery shopping, gardening, washing your car, yoga and dancing all burn calories. Walking in particular is recommended and you can start with a brisk 15-minute walk at lunch. As your fitness improves you may wish to add strength training because it helps build lean muscle, which increases your metabolism. 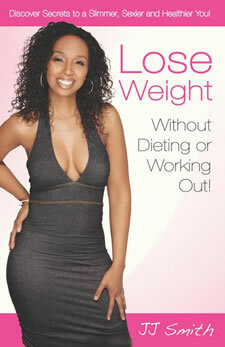 Lose Weight Without Dieting or Working Out: Discover Secrets to a Slimmer, Sexier and Healthier You retails at $19.95. Encourages consumption of fresh, unprocessed, organic, whole foods. Should produce rapid weight loss results during the first three weeks. Can assist with elimination of stubborn fat. Appeals to those who don’t enjoy traditional exercise. The first phase is very strict and requires elimination of sugar, coffee, alcohol, meat, eggs and dairy. Requires colonic irrigation or colon-cleansing herbs. Necessary to use nutritional supplements. Does not contain a structured meal plan or recipes. May involve more time for meal planning and food preparation. This program starts with a 21-day detox diet, which is followed by a “clean and balanced” approach to eating. By emphasizing nutrient-dense whole foods you will naturally achieve your ideal weight, better health and a more youthful appearance.